IDRIA ENERGY JOINED FORCES with XUN OIL in order to collaboratein the trade of fuels, crude oil and commodity trades. The group does business as IDRIA XUN ENTERPRISES LIMITED. 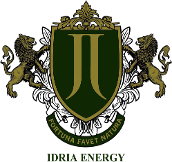 IDRIA ENERGY's specialized focus is in petro products and currency trades. It buys products from refineries and sells to distributors all over the world. The petro products include A-1/TS1 and crude oil.